NP GroupBlogTechnologyIs CaaS Ready for Prime Time? One of the latest emerging technologies in the content management space is the concept of Content as a Service, or CaaS. Much like SaaS (an acronym we are all familiar with), CaaS providers offer hosted solutions aimed at making content management something you can offload to a third party. In fact, you may have already heard of some of the bigger players in the space today, such as Contentful, Kentico Cloud, CloudCMS and Osmek. The theory behind these services is that a hosted, third-party CMS platform can store and manage your content, allowing you to connect via API or other means to publish your content elsewhere. Before I dig too far into specifics, I want to address the theoretical concept of these services. Each of these providers are absolutely correct in offering headless or decoupled content management services. This methodology is the future, and we’ve been talking about it on our blog, e-books, and webinars for quite some time. At a top-level, I give great credit to these organizations for publically staking a claim that the decoupled approach is highly beneficial, and thank them for their efforts to bring it to the mainstream. I also give them credit for providing a service that allows technologists to easily roll out content management, allowing them the freedom to focus on user experience and content delivery. In this way, these providers are leading the pack and well ahead of the majority of the CMS industry’s major contributors. However, I do have concerns about the CaaS concept. With any new technology offering, customers need to carefully consider the pros and cons with a focus on the long-term stability, scalability, and flexibility that they provide. With that in mind, here are some points to consider if you are contemplating a CaaS provider. Technologist are always debating about what platform to build their project on. We see clients come to us with all sorts of technology requirements–what libraries to use, how to configure the database, etc. This is to be expected. When contemplating architecture for your application or website, factors such as speed, scalability, reliability, and security must be considered. Herein lies the biggest uncertainty about CaaS: When you outsource your content management platform to a CaaS service, you can never really be sure exactly what is running under the hood. And as a side-effect, you can’t be sure that it can truly scale, or that it is dependable. The fact is, there is a large amount of uncertainty that you’ll be forced to accept when building an application or website that depends on a third party for the core of its content hosting needs. Remember: The CMS is the hub of your digital presence. Is this the best segment of your infrastructure to take away from local control and hand to a third party? Any future downtime on the part of the provider will result in your product being unavailable. Any changes they make in the future may affect how your services work. And as their services grow, any slowdowns in delivery will affect your users’ experience. Any of these nightmares are what get tech guys replaced by eager and antsy CEOs. During the sales process, I tell all prospective clients that they should consider me as a “mercenary CTO.” As part of that role, I carefully weigh pros and cons of their options, with the ultimate deciding factor being a determination of risk versus reward. Hosted solutions always are difficult to realistically consider simply because the risk factor is too high. In the case of CaaS, do the risks outweigh the benefits? To a certain extent, any decision you make regarding your CMS is going to lock you into a single solution for quite a while. With CaaS, however, you are locking into not only the software itself, but the service provider as well. When you build out a custom system, you take ownership of the software, securing complete control over the future aspects of your platform. And even when you utilize off-the-shelf software, you are licensing an instance of software that you can then (provided you have chosen open-source) customize and amend in any way you deem fit. With CaaS, on the other hand, you are licensing software but have zero claims to the platform. In addition, you have no ability to amend, modify, improve, or iterate the software you are using. In this way, you are now a partner with the provider—only the partnership isn’t equal. Why is this important? 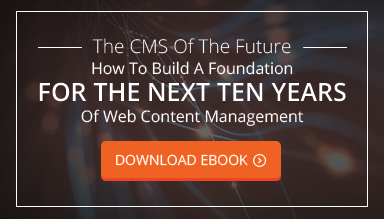 Again, the CMS is the core of your digital efforts. Utilizing a CaaS provider to power this essential component of your business means that future technology decisions that are integral to your business will not be made only by you. In fact, you probably will have little or no say in the actual iteration of the product. When a software platform is charging you fees that can be as low as a hundred dollars a month, you have to assume they are counting on thousands of customers utilizing the service. Getting individual attention will not be possible. Is this the type of relationship you want to build your business around? As an extension to my previous point, when you utilize CaaS, you are locked into the vendor, not just its software. This means the fate of the vendor will determine the success and the ongoing stability of your application. It’s worth noting that many of the players in this space are start-up companies. If something were to happen to their business such as a lack of liquidity or legal action, you would suffer as a result of the action. This factor alone is enough to warrant careful consideration when determining your plan moving forward. Granted, some organizations severely limit this risk. If you run an informational site on HubSpot, for example, it’s unlikely they will shut down tomorrow with no notice. But start-ups fail all the time. In fact, most fail more than succeed. This must be considered carefully, because if your chosen service provider were to close its doors today, there is no way you can assume the software yourself and keep your website functioning—you have zero claim to it! In fact, you’d be lucky to even get your content back. And that is absolutely a nightmare that would make a CEO flip his or her lid! One of the limitations of these CaaS solutions that users will immediately see is that the administrative portion of the offering is not bespoke, or built to your specifications or for your unique use case. For some users, this may be just fine, but our belief is that since your CMS serves as the digital hub of your entire business, the UI/UX matters greatly. UI/UX makes workflows that were previously tedious into simple, repeatable procedures. It also unifies the experience within your company, allowing all user roles to utilize the same platform regardless of their unique day-to-day responsibilities. The hosted CaaS solutions are decent to this end, no doubt, but at the end of the day, are they being modified to fit your needs or will you be amending your processes to use them? Unfortunately, as our next point will clarify, these systems are built for the masses and general use cases, so most likely, it will be you, the user, that will have to adjust how you work. Yes, the purpose of decoupling is to enable you to deliver your content to multiple channels. There is no doubt or argument about that. But what about your largest channel, which is still the Web for the majority of businesses? These CaaS tools are lacking in their control over Web-based experiences for users. Features such as previewing how a site will look with new content, for example, are not typically included in these packages. Likewise, what about other CMS functionality you may need, such as app management or control over other content experiences? The best decoupled CMS will offer a suite of tools specific to each distribution channel so you have the utmost control over the end user experience in each venue. This argument applies to almost any mass-deployed piece of software. It isn’t built for you, it’s built for a large audience of people. This means it’s designed to handle the 80% of common uses cases, the general applications, and tasks that most users require from day to day. With some software, this is a perfectly fine concept. We all use Microsoft Word or Excel, and to build something similar just for us specifically would be insane! But again, when it comes to web content management, the most common uses cases are not always going to solve the more complex problems. Almost every content-centric organization has its own special way of creating, organizing, and distributing content. For many, that 20% of unique functionality may be the reason that they are in business in the first place. CaaS solutions are not meant for those purposes. Prospective customers often have the same conversation with me. They say they can use off-the-shelf software or CaaS solutions to handle all their needs. Then I ask them what makes their business special. Is it a process, content creation workflow, or some other way of doing business that makes them stand out from their competitors? Almost always, what makes them special is the precise reason they shouldn’t be using software off the shelf in the first place! It’s amazing how on one hand, business owners believe they are completely unique, but then on the other hand, they’re willing make do with software built for either the general population or someone else. Your business is special. And you must differentiate. “Sameness” does not breed success. If content is your main source of output for your enterprise, you should follow the example of the leading publishers in the world and consider more bespoke options, customized for your purposes. The use case for these CaaS platforms is actually quite limited. As I mentioned before, they can’t be developed to serve as the business hub of your organization; they can only help manage your content. So building unique functionality on top of these platforms will be difficult, if not impossible. You can’t build a paywall and subscription portal utilizing an API with a service like this. Likewise, you can’t build complex lead management workflows or advanced publishing and distribution rules. Eventually, if you are building anything other than a pure content play, you will run into roadblocks expanding upon how your site works. These are not content creation tools as much as they are content management and distribution tools. So if you are aiming to build a system that handles content creation across your entire enterprise in addition to management and distribution, you will find these tools lacking. As with my previous point, consider what makes your business or mission unique and analyze how you could build out a perfect solution to manage it. Then compare it against these offerings and you’ll quickly gain a sense of where their shortcomings fall. The CaaS space is really too new to consider it as a serious contender for enterprise-level applications. Conceptually, as I mentioned before, we are strong believers in the decoupled methodology. But since these services offer relatively weak content management tools, it almost seems that all they do well is tie together data with APIs that are useful for distributing said data. And if that is the case, there are many other providers or software packages that can do a much better job. We’ll be keeping an eye on CaaS with an optimistic eye as the years progress. Much like any other custom versus off-the-shelf software debate, CaaS will always have limitations, but we are hopeful that the concept will gain traction—especially since CaaS services have the best potential to mainstream the decoupled or headless philosophy to a broader audience of technologists.